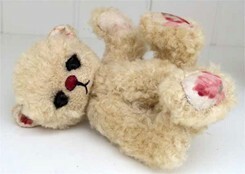 Stine Birkeland of Stine-Teddies traveled extensively through Denmark with her husband, Jorn, who was an army officer. Now, they live in a small village in a house that was a former grocery store. "We have lots of space," Stine said. Space enough for family, teddy bears and her dogs. After renovations, she felt she had lots of room to meet her bear-making needs. "I even have a knitting machine, along with my sewing machine and there is still room for my paper stuff as she also enjoys scrap booking. It all fits together with my computer in the same room." 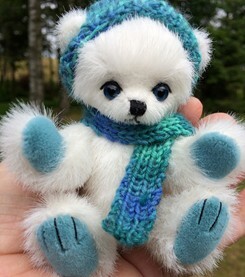 Stine has been making bears for the last 15 years. 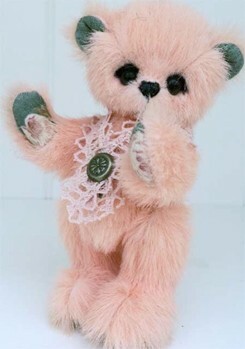 In 1999, she met a person in her doll house club who had made a few bears. "The thought was quite new to me, but I loved having stuffed and live animals all my life and thought that this would be something for me." In the beginning it was a very rewarding hobby. Now it has grown into a rewarding career. "When I first started, my youngest son was 16 years old and he was very embarrassed when he brought friends home because there were teddy bears all over the place. However, he fully accepted my passion for the bears and soon he would comment positively on the bears too." 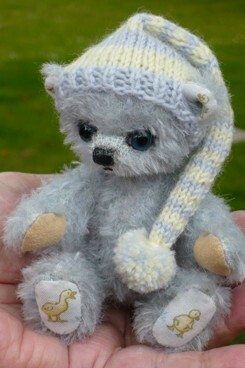 She designs and sews all the bear herself and often knits accessories for the bears. Stine finds inspiration from the teddy bear fabric and also from patterned fabrics. "My favorite part of bear making is making the face. It can take hours to decide colors of noses, eyes and to sculpt and cut the muzzle into shape. From year to year, she has varied how many bears she's has made, and typically makes between 20-50 bears per year. 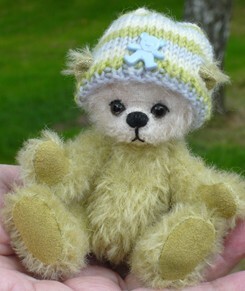 Stine had a couple of years with almost no bear-making while her husband battled and won a fight with cancer. Now that he is well again, she is back and feeling inspired. 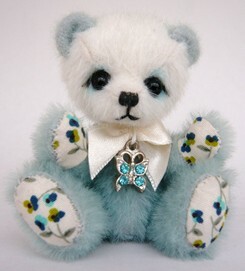 Stine's bears are mainly miniature in size now, ranging up to 5". 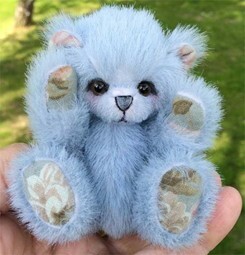 "I started making big bears and did this for quite some years. The bears always had embroidered foot pads. However, after a hand injury, I could not cut and sew the mohair. 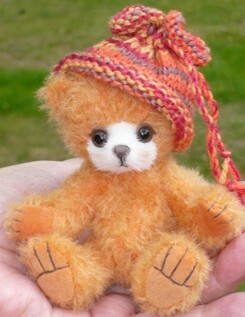 I found that fabric used for miniature bears was much easier and less stressful for my hands. 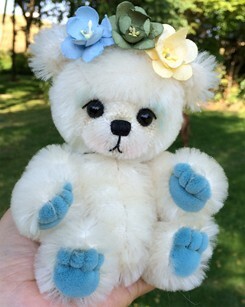 I started making the smaller bears about 5 years ago." It turned out to be a success. She is very pleased with the size of the bears. "I think it is a nice size and the bears are big enough that I can use all sorts of materials. It was fate that made me change from big to small bears," she confessed. 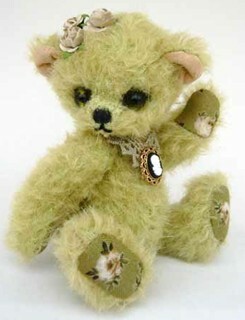 Stine sells her bears through her website, blog, Bears&Buds and Facebook. She attends shows in Germany, Sweden and Great Britain. 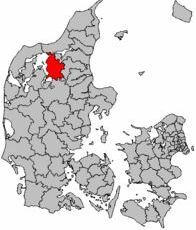 "Unfortunately, Denmark is too small of a country to host these shows. We have neither artists nor collectors enough to handle it." Thankfully, through the Internet, she can share with other artist and hunt for materials. When asked about her plans for the future, she replied, "My plan is to make many more bears and I do what I can to make other crafters interested in bear-making. However, I find that it is not easy. They love the bears but they do not want to make them themselves." She added,"I hope to attend more shows abroad as the personal contact with other artists and collectors is fantastic and my husband and I have some nice times when going abroad to exhibit." She hopes to attend a show in the United States some day as well. "I cannot imagine a better life than the one I have with family, friends and dogs in the lovely surroundings of the countryside, filling a lot of the time with bear related things. Everyone I know is supporting my bear making efforts. It means a lot to me." Artists - would you like to be seen by our worldwide readers each month? Become a Professional Artist-Member of Bears&Buds today!Advertise FREE ! Your membership password will take you to the B2B section loaded with selling, making and how-to ideas.